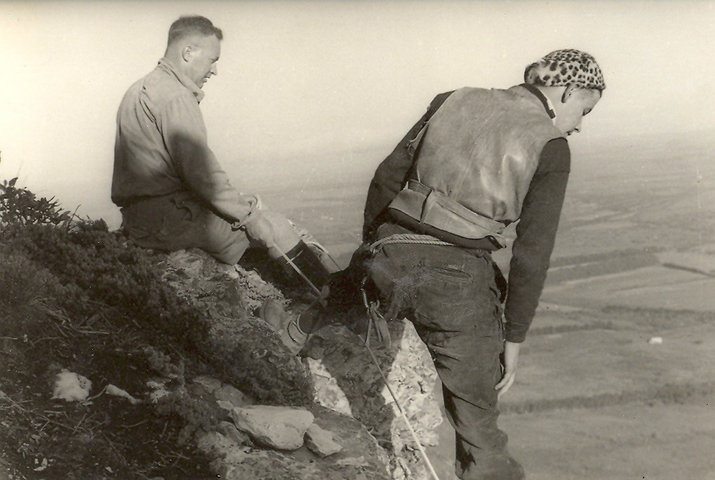 R Wood & Joan Mills on the summit of The Heel ~1950, Photo courtesy Rob Mac Geoghan collection. 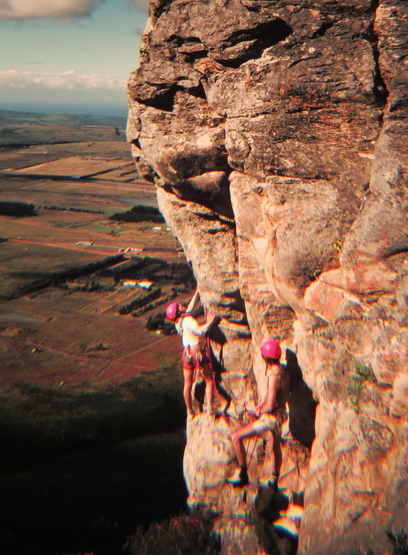 Donald & Peter Blignaut climbing in The Goldern Era Sector, on Lady's Slipper ~ 1950. Photo courtesy Rob Mac Geoghan collection. 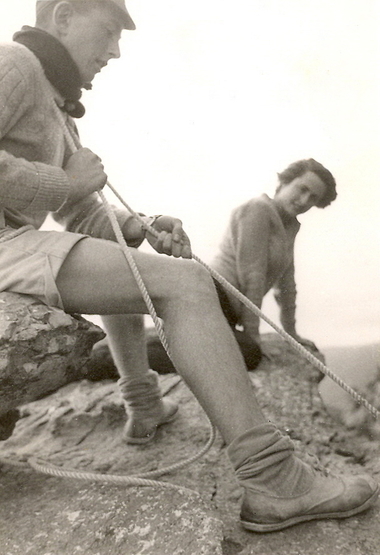 Donald Forsythe & Joan Mills on Slipper 1951, Photo courtesy Rob Mac Geoghan collection. 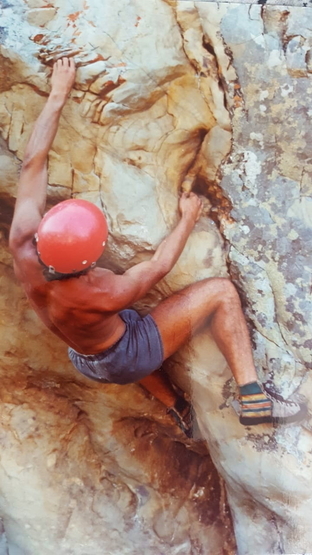 Rob Mac Geoghan on piton crack, note the parabat kevlar helmet ~ 1987. Photo courtesy Rob Mac Geoghan collection. 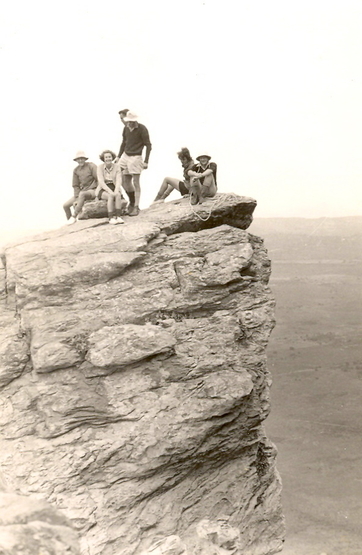 Joan Mills, Erik Manson, R Wood, Donald Forsyth on the summit of The Heel at Lady's Slipper ~ 1950. Photo courtesy Rob Mac Geoghan collection. 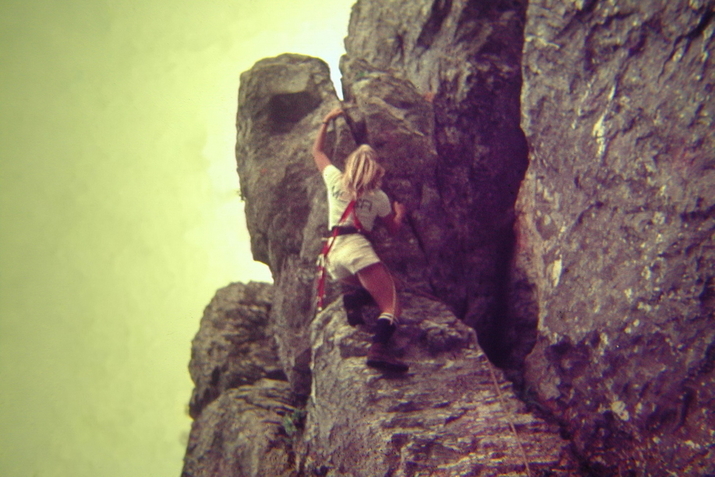 Climbers body belaying on Lady Slipper ~ 1950. Photo courtesy Rob Mac Geoghan collection. 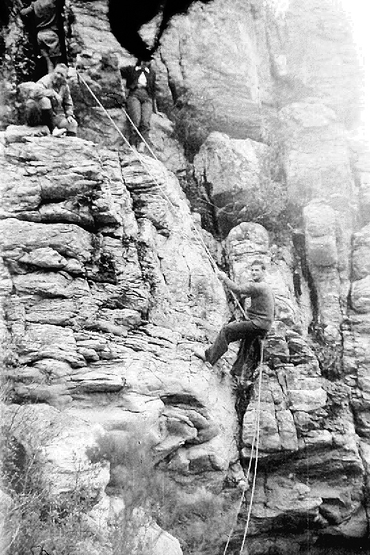 John Alexander climbing McKechnie’s Overhang (20) Early '80, photo from John Alexander collection. 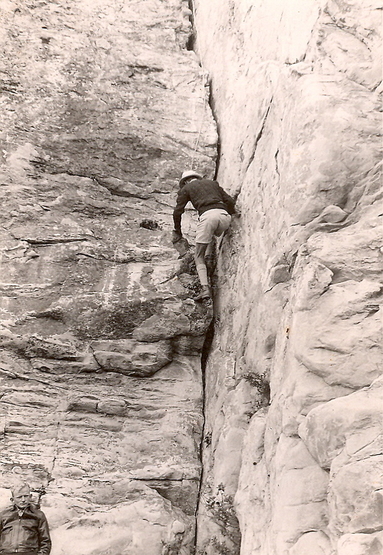 Eric Manson climbing the classic Piton Crack 1952, Photo by Ian Philips, courtesy Rob Mac Geoghan collection. 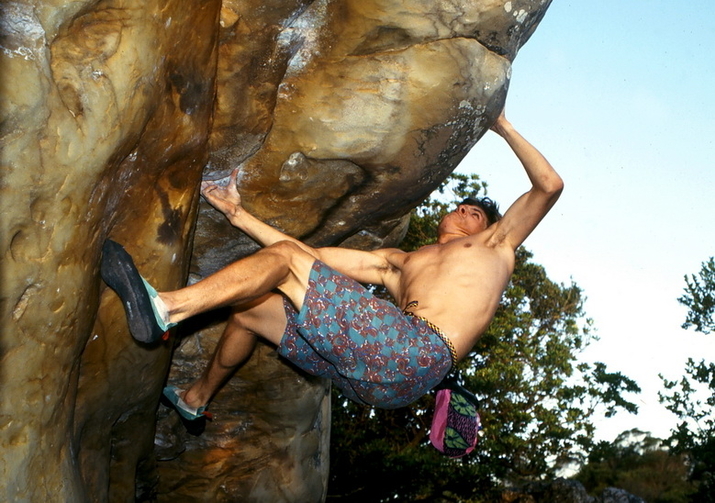 Andy Wesson bouldering on After Dinner Mint in about 1993, photo thanks to Andy Wesson collection. 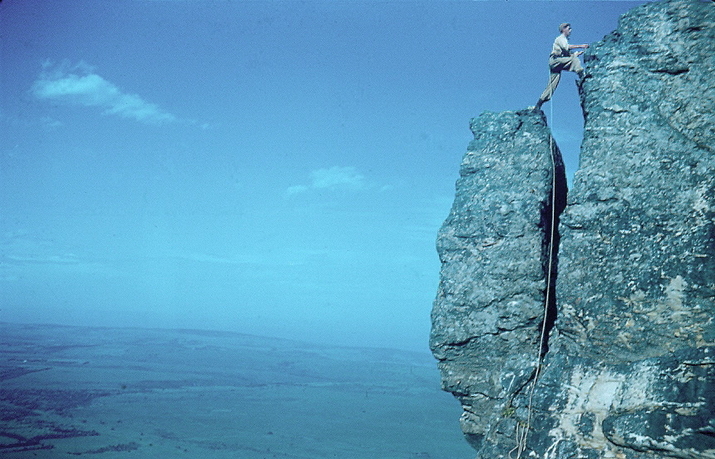 Eric Manson & Rosemary Wood climbing on Lady's Slipper 1952, Photo courtesy Rob Mac Geoghan collection. 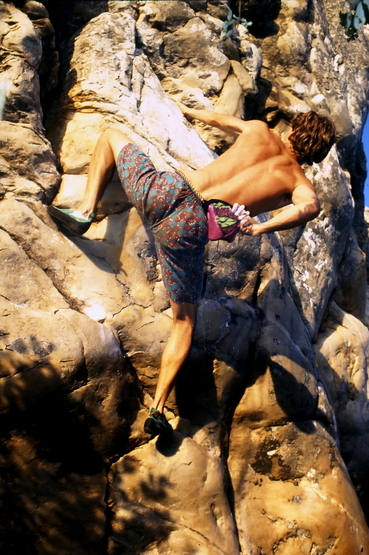 Eric de Beer bouldering at the Slipper 2002, pic thanks Eric De Beer collection. 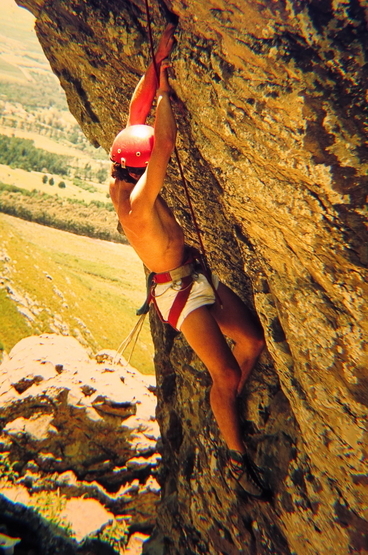 Rob Mac Geoghan (the Pope of PE climbing) opening Harrier 1982. Photo courtesy Rob Mac Geoghan collection. 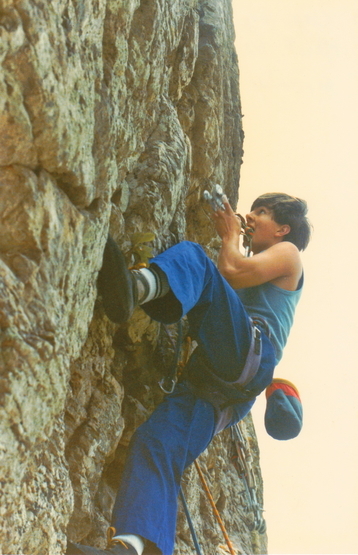 Andy Wesson on Social Cabbage 7A+ After Dinner Mint in about 1993, photo thanks to Andy Wesson collection. 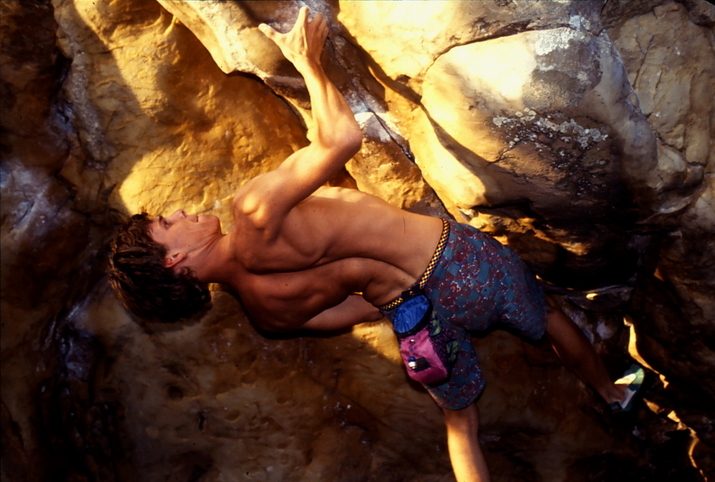 Craig Reynolds on the classic 6B+ All I Need at After Dinner Mint in about 1993, photo thanks to Andy Wesson. 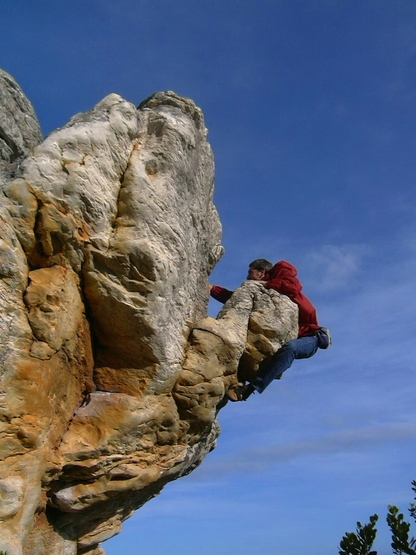 Eric de Beer PE local bouldering on the Slipper 2002, pic thanks Eric De Beer collection. 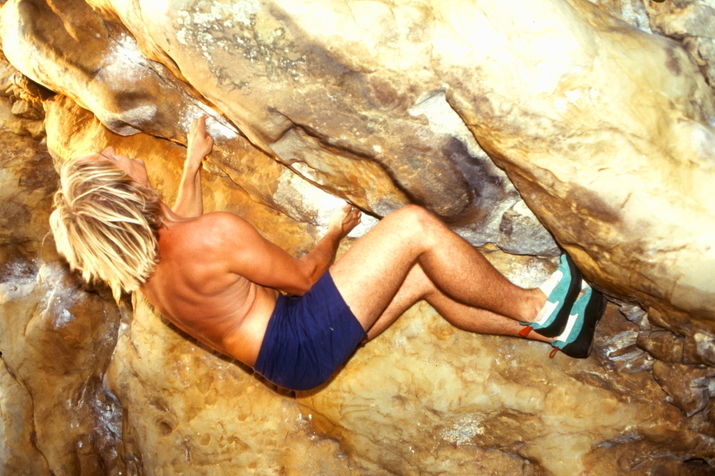 Andy Wesson on the classic 6B+ All I Need at After Dinner Mint in about 1993, photo thanks to Andy Wesson collection. 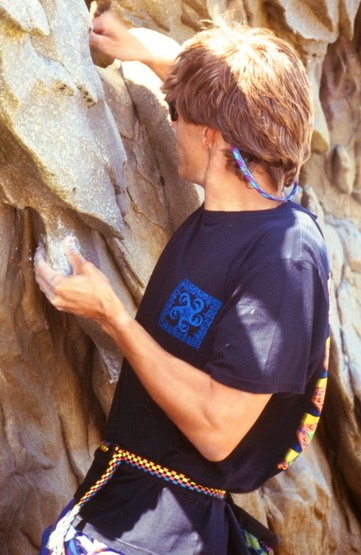 Andy Wesson Slipper Boulder Truth 6A at After Dinner Mint in about 1993, photo thanks to Andy Wesson collection. 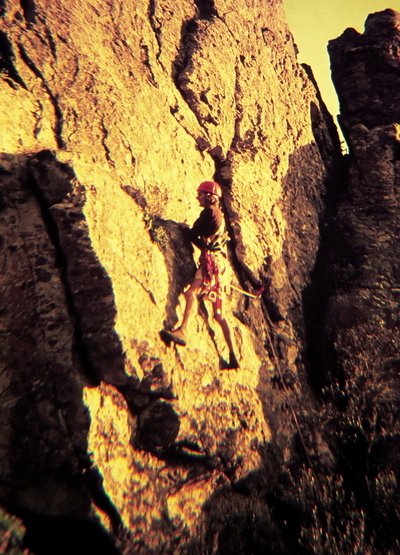 Harry Yoko abseiling at The Fire Place Area ~ 1950. Photo courtesy Rob Mac Geoghan collection. 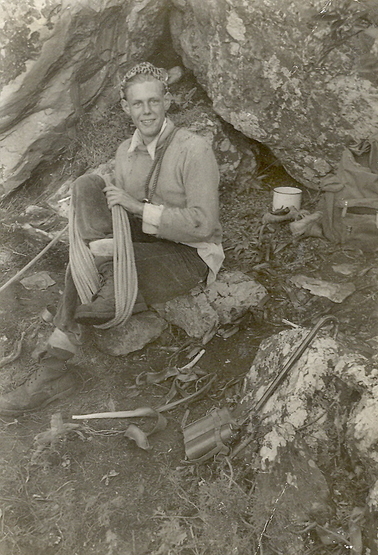 Scrambling near Piton Crack the classic 14 ~ 1950 photo courtesy Werner Illenberger. 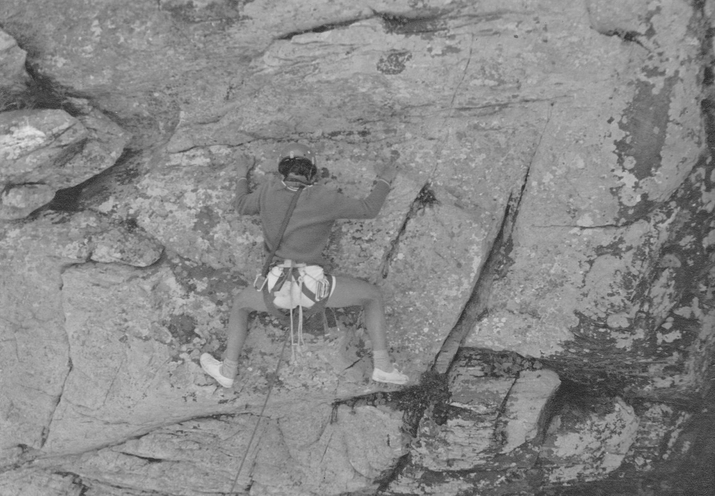 Heel abseil circa 1953. Photo courtesy Rob Mac Geoghan collection. 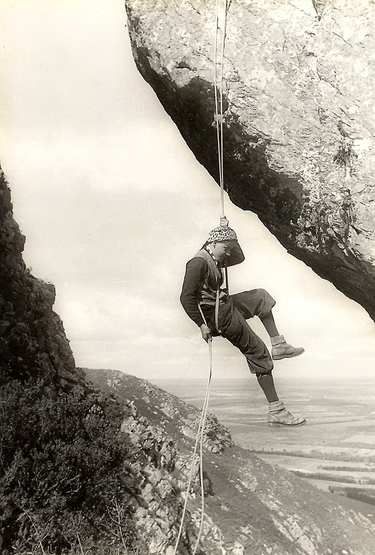 Peter Bicknel on Slipper, 1951. Photo courtesy Rob Mac Geoghan collection. 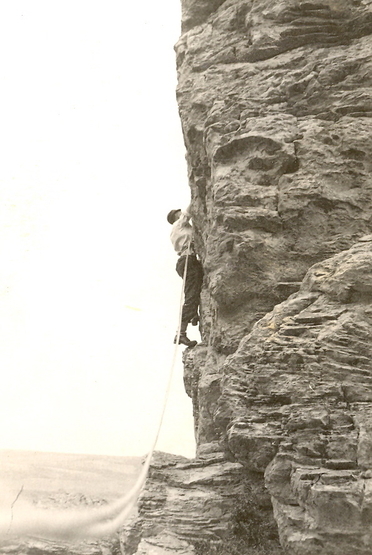 Climber on what is now Water Babies (14) in Back In The Days Sector, 1952. Photo courtesy Rob Mac Geoghan collection. 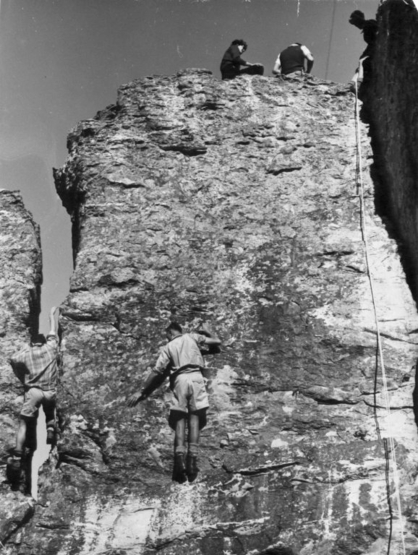 Climbers on Battle Face ~ 1950. Photo courtesy Rob Mac Geoghan collection. 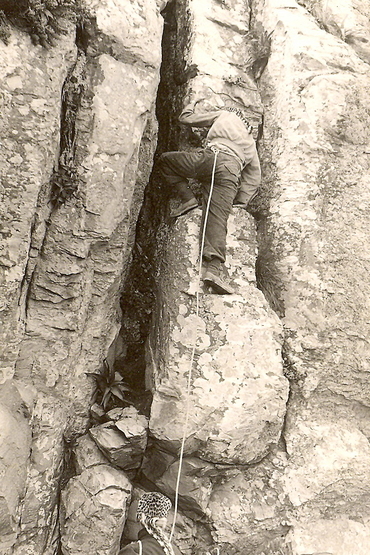 Climber on The Heel on Lady's Slipper ~ 1950. Photo courtesy Rob Mac Geoghan collection. 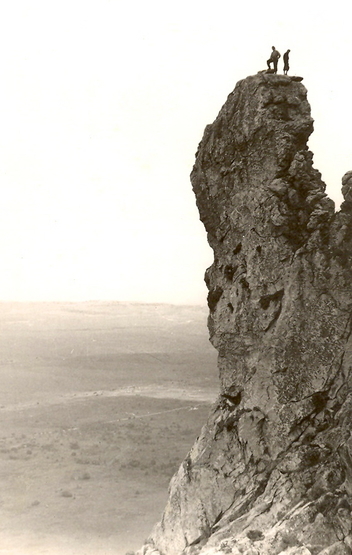 Harry Yoko climbing piton crack ~ 1950. Photo courtesy Rob Mac Geoghan collection. 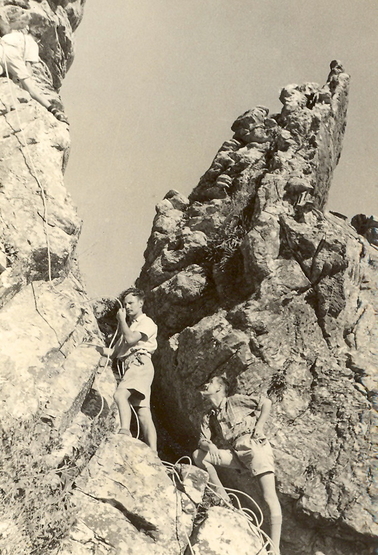 Harry Yoko belaying & Ludwig Abel climbing ~ 1950. Photo courtesy Rob Mac Geoghan collection. 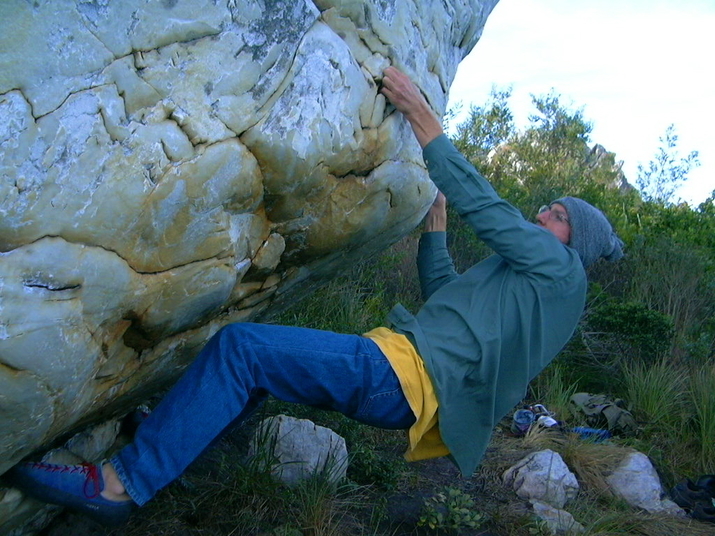 Allen Luck opening a new line on the Lady's Slipper, 2006. Photo courtesy Rob Mac Geoghan collection. 1974 Pixies Pitch Mike McKechnie. Pixies Pitch is named after Franz Nel AKA Pixie. 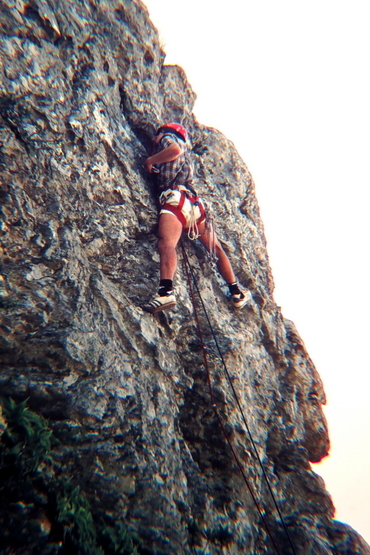 In those days Pixies was a popular climb often repeated. Photo thanks to Mike McKechnie collection. 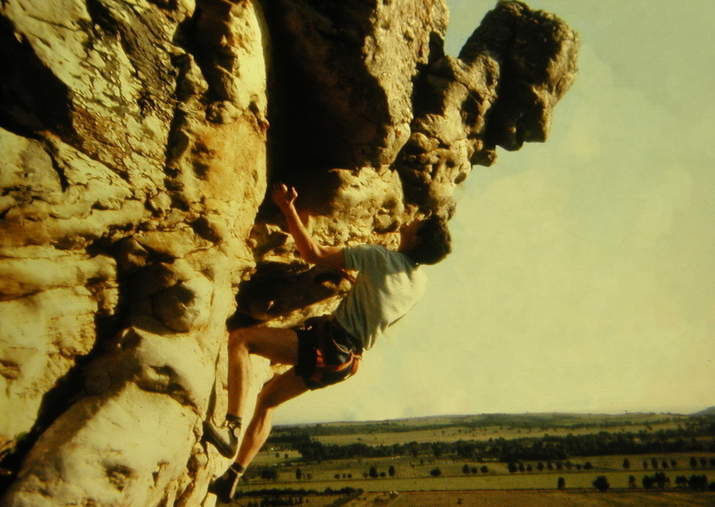 1977 Mike McKechnie on what we now call 1987 (5C) On the After-Dinner Mint boulder. Photo thanks to Mike McKechnie collection. 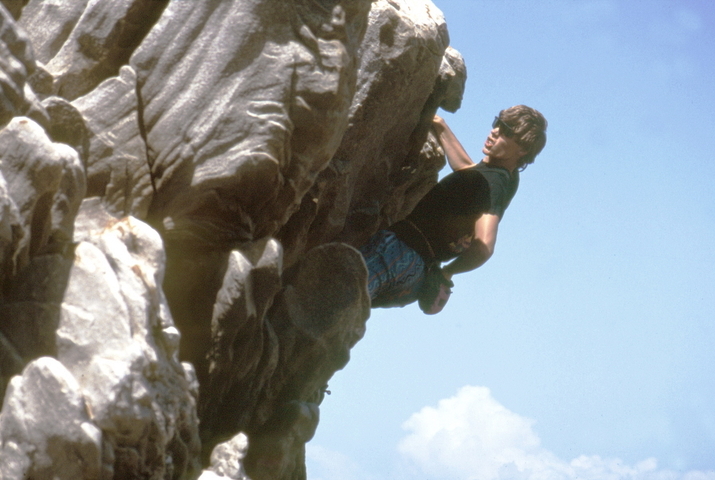 Mike McKechnie on After-Dinner Mint (6A+) ~ 1980 Photo thanks to Mike McKechnie collection. 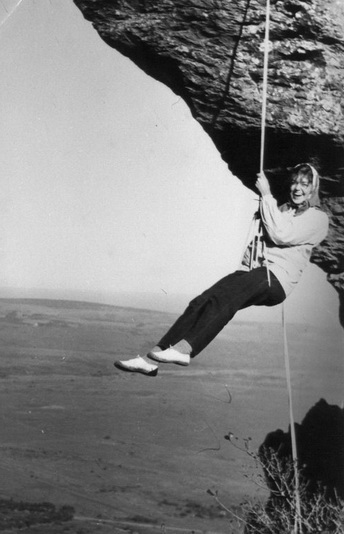 Kim Cadle climbing Grovelers ~ 1978 Photo courtesy Rob Mac Geoghan collection. 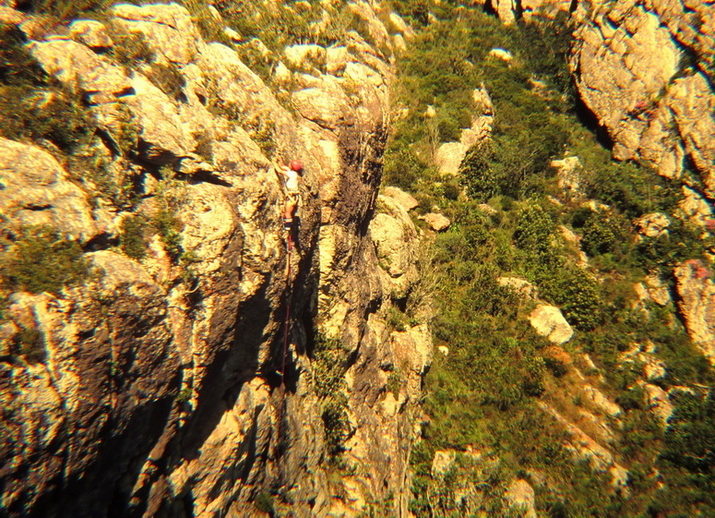 Mike McKechnie climbing to the left of Piton Crack. 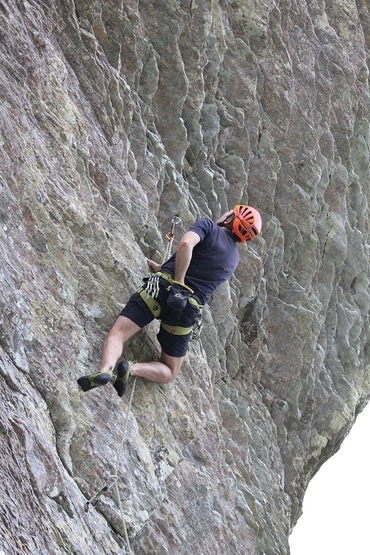 Note the crazy body belay technique. ~ 1978 Photo thanks to Mike McKechnie collection. 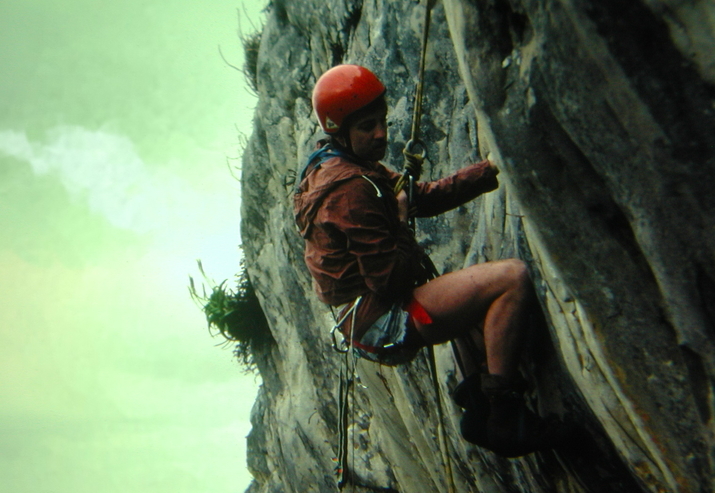 Rob Mac Geoghan climbing Pixies Pitch ~ 1980 Photo courtesy Rob Mac Geoghan collection. 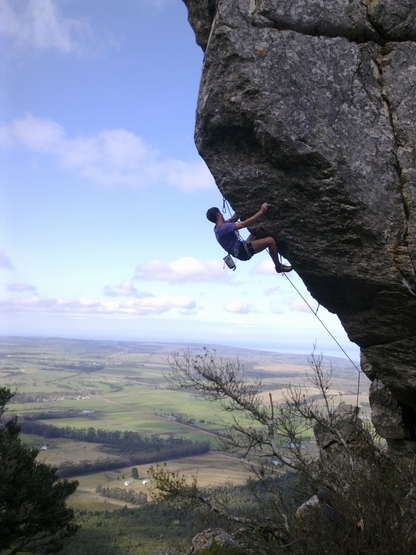 Andrew Forsyth aiding up Hollow Men (22). Andrew latter freed it in 1985 Photo thanks to Mike McKechnie collection. Andrew Forsyth aiding & cleaning Hollow Men (22). ~ 1985 Photo thanks to Mike McKechnie collection. Mike McKechnie gardening the Gutter on Battle Face ~ 1983 Photo courtesy Rob Mac Geoghan collection. 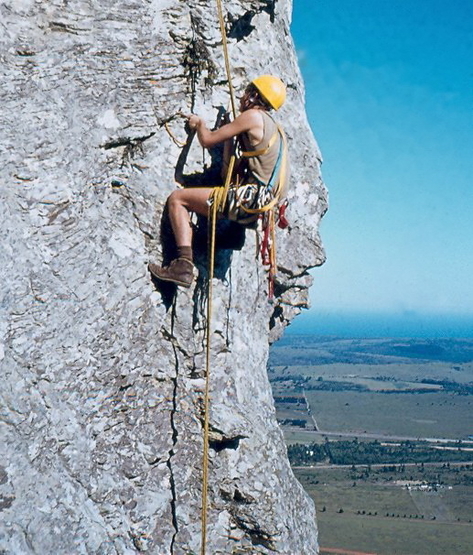 Brad Sharp belaying & Mike McKechnie climbing what would later become McKechnie's Madness (20) ~ 1978 Photo thanks to Mike McKechnie collection. 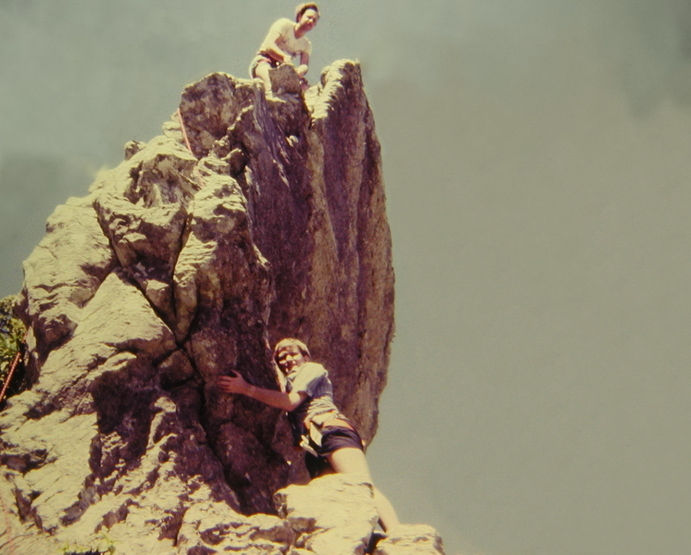 Arthur Harlow, early climbers on The Heel, Lady's Slipper ~ 1950 photo courtesy Werner Illenberger. 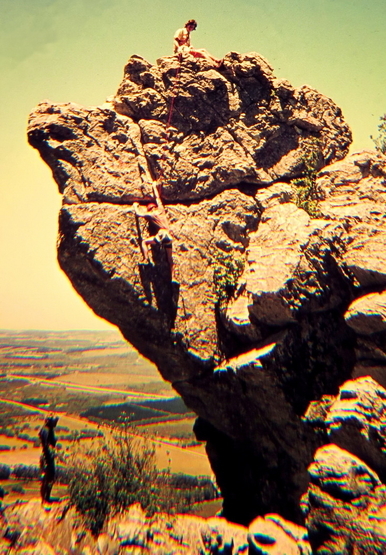 Andrew Forsyth at Turning Rock ~ 1980 Photo thanks to Mike McKechnie collection. 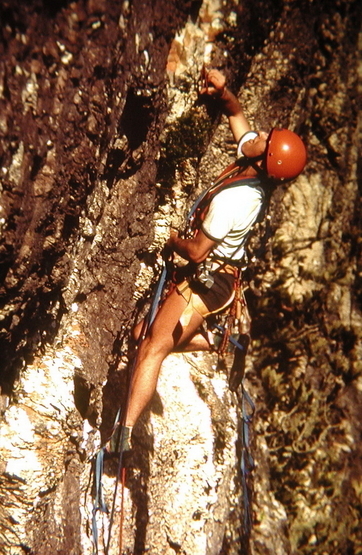 Rob Mac Geoghan's father abseiling ~ 1960. Photo courtesy Rob Mac Geoghan collection. 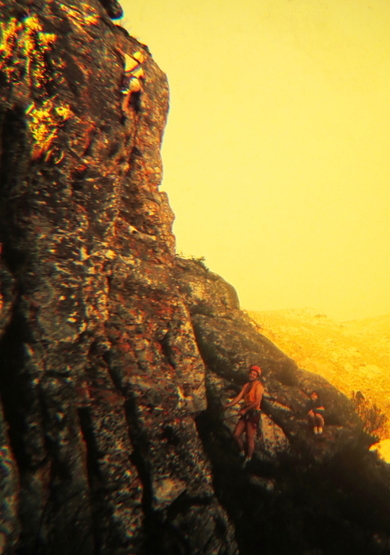 Andrew Forsyth climbing & Mike McKechnie belaying at Back in the Day's Sector ~ 1980 Photo thanks to Mike McKechnie collection. 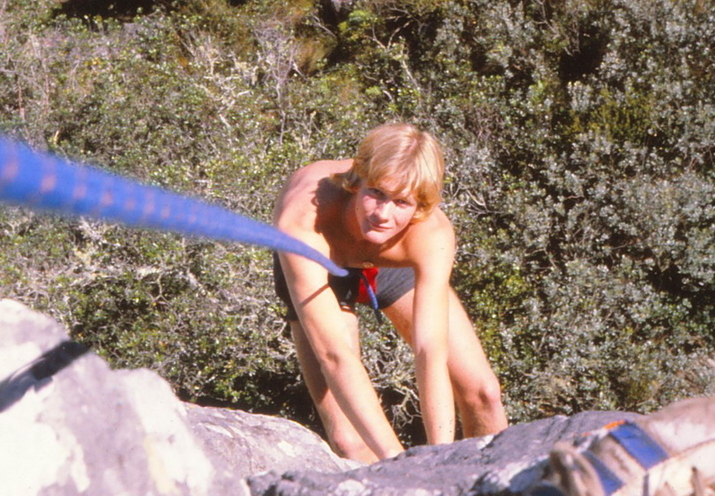 Andrew Forsyth, note the squash takkies ~ 1985 Photo thanks to Mike McKechnie collection. 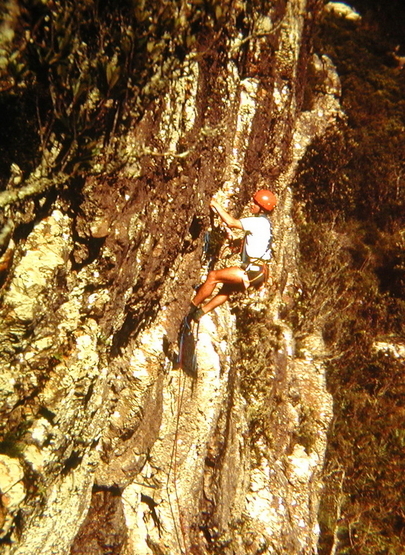 Gill Shapley abseiling on the Lady's Slipper ~ 1960, photo courtesy Werner Illenberger. 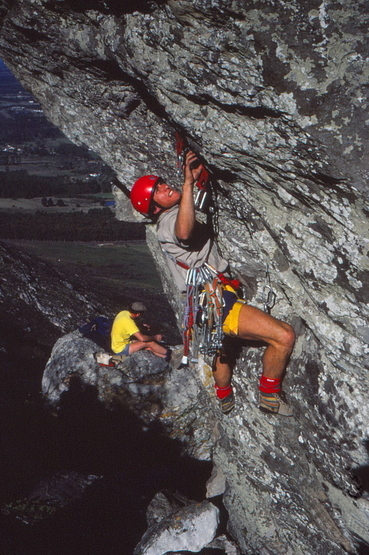 Andrew Forsyth climbing at Twinkle Toes Wall ~ 1985 Photo thanks to Mike McKechnie collection. 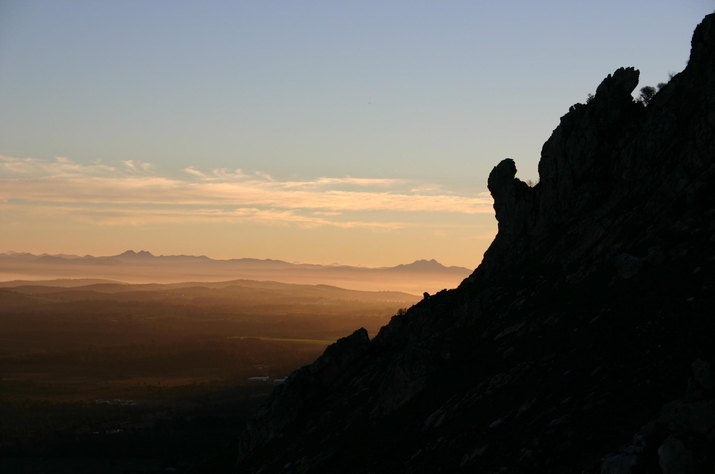 Lady's Slipper from the east as the darkness falls, picture taken by Derek Marshall. 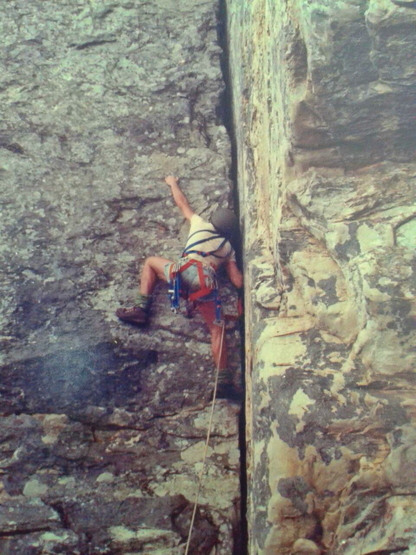 Andrew Forsyth aiding & cleaning somewhere on Twinkle Toes Wall ~ 1985 Photo thanks to Mike McKechnie collection. 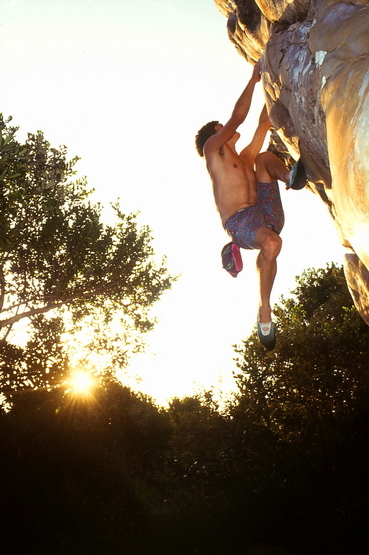 Flex sending Screamer (29) at Hidden Boulder on the 2009 Petzl Rock 'n Road Trip. 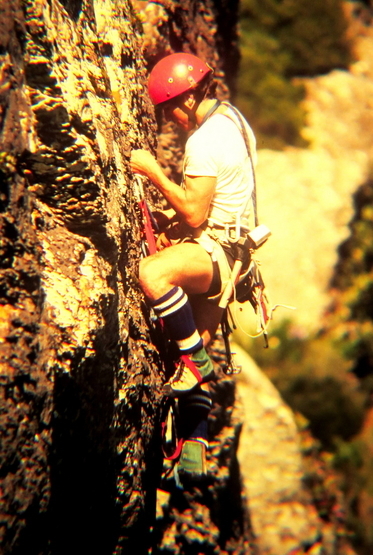 Photo thanks to Martin Renz collection. 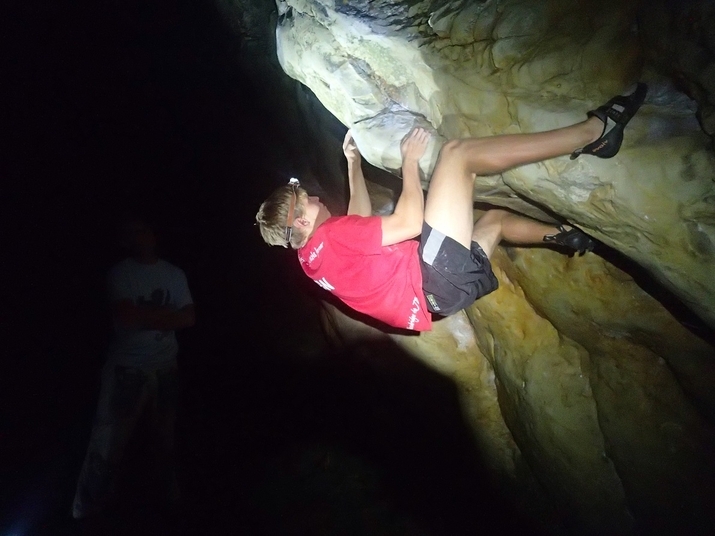 Lady's Slipper Bouldering - After Dinner Mint. 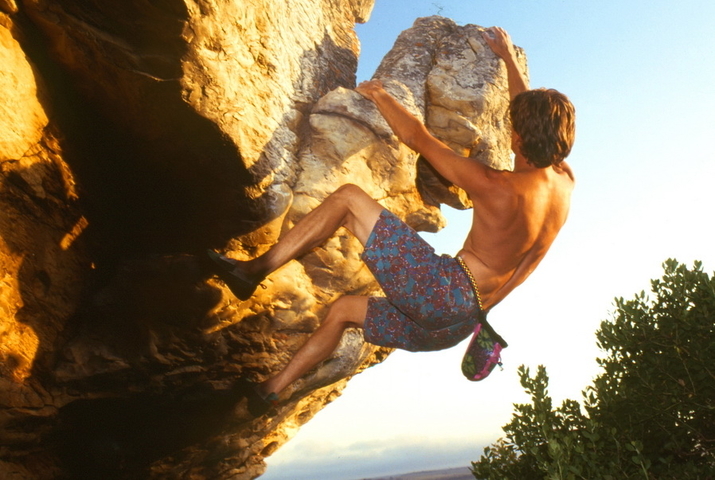 Dricus Bezuidenhout bouldering on the Slipper 2002, pic thanks Eric De Beer. 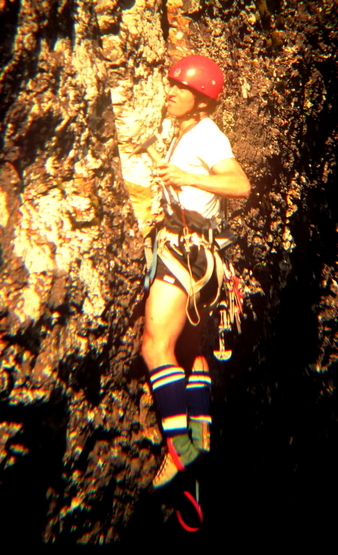 Andrew Forsyth aiding & cleaning somewhere on Twinkle Toes Wall note the hockey socks. ~ 1985 Photo thanks to Mike McKechnie collection. 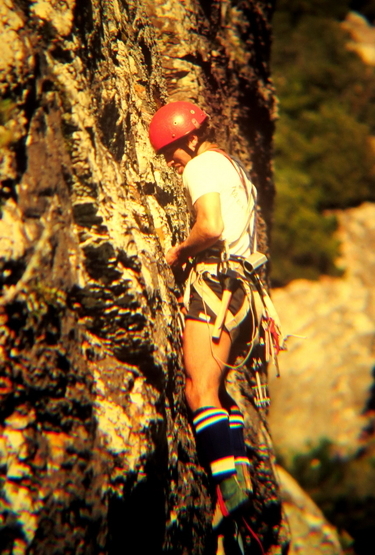 Andrew Forsyth cleaning somewhere on Twinkle Toes Wall. Those solid bar friends would have been some of the first in the EC ~ 1985. Photo thanks to Mike McKechnie collection. 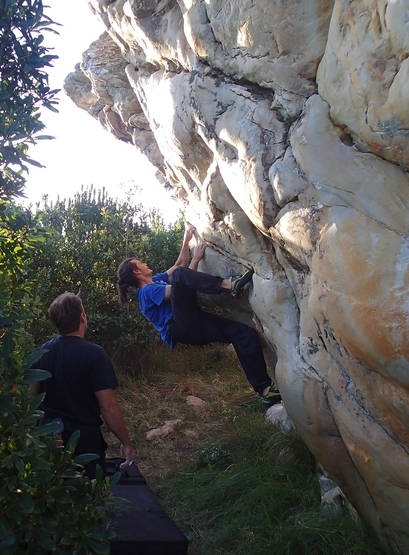 Lady's Slipper Bouldering on After Dinner Mint. 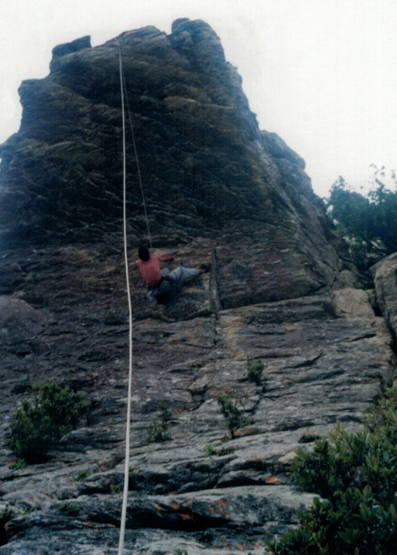 Lady's Slipper Rock Climbing some where on The Heel. 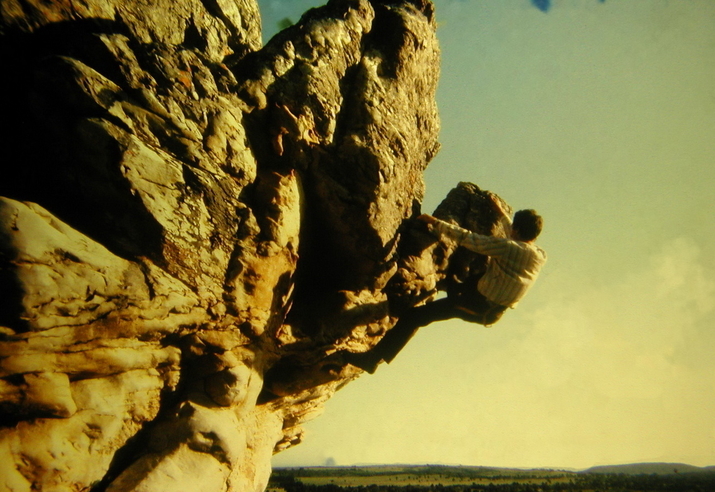 Andrew Forsyth bouldering at After Dinner Mint ~ 1980 Photo courtesy Rob Mac Geoghan collection. 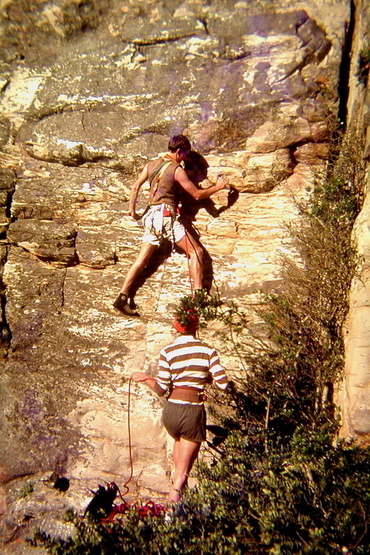 Andrew Forsyth belaying an unidentified climber at the Rhino ~ 1980 Photo courtesy Rob Mac Geoghan collection. 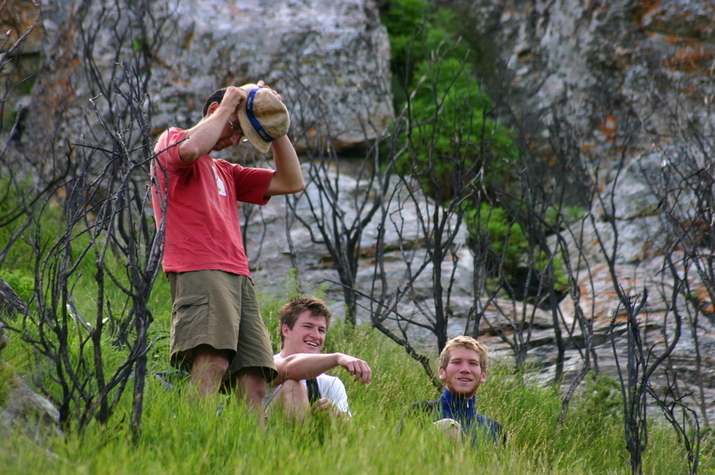 PE Friendly Penguins explore the Slipper after the fire in 2004. 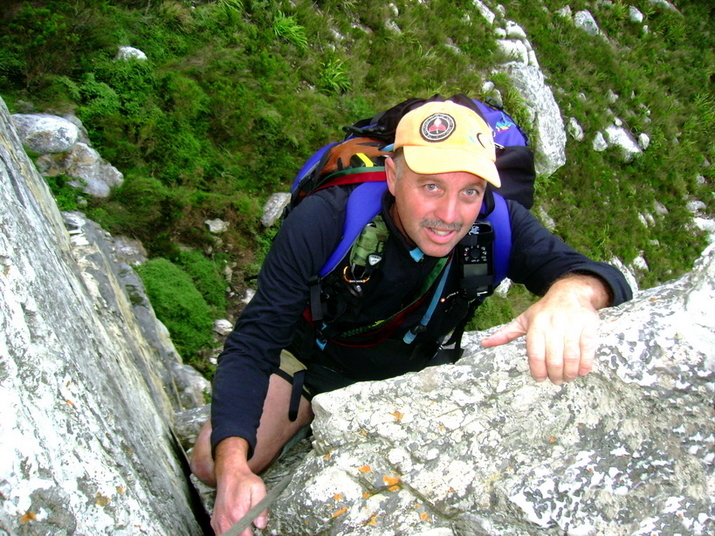 Dricus Bezuidenhout standing, Stephen & Morne van der Mescht. 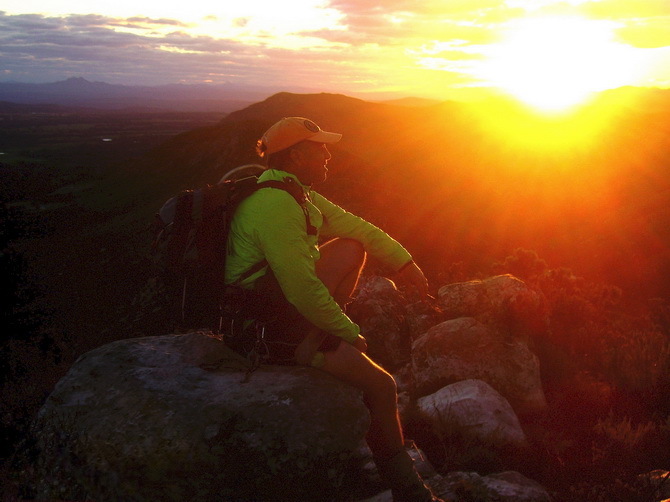 Spectacular Slipper sunset 2006. Photo courtesy Rob Mac Geoghan collection. 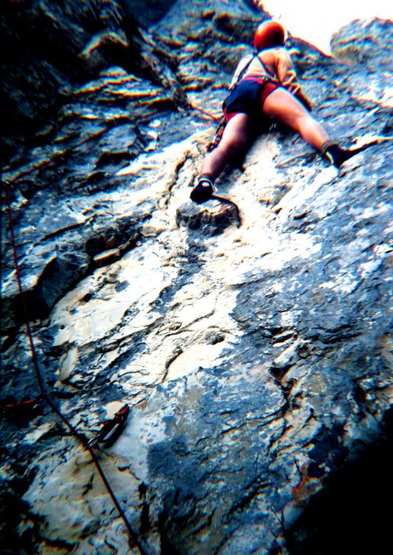 Climbing at Lady's Slipper, Clee Roy leading The Hollow Men (22) - Sept 1985. Photo courtesy Andrew Forsyth. 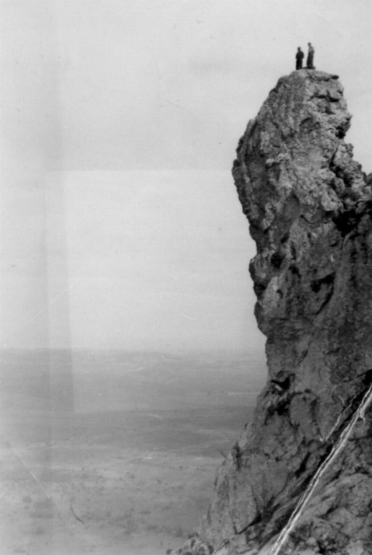 Rob Mac Geoghan belaying a climber up Sky Line on The Wave ~ 1980 Photo courtesy Rob Mac Geoghan collection. 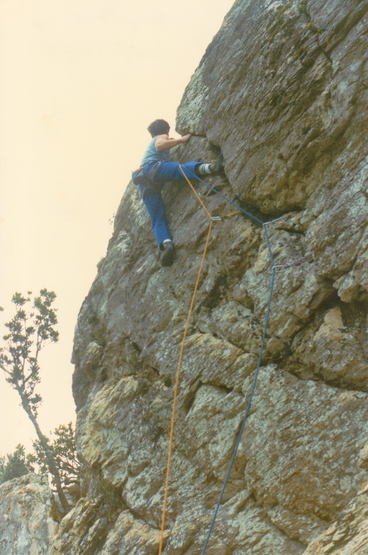 Clee Roy leading The Hollow Men (22) - Sept 1985. Photo courtesy Andrew Forsyth. 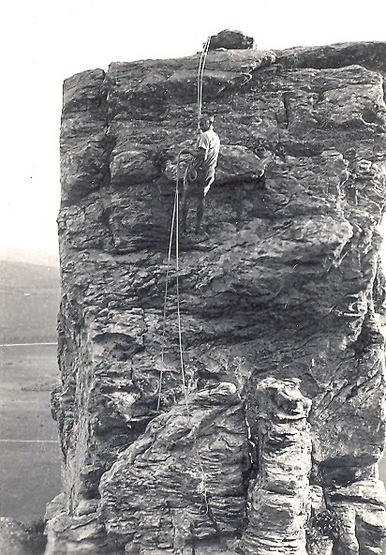 William Quicksley belaying an unknown climber up what we now call 1887 (5C) On the After-Dinner Mint boulder. ~ 1980 Photo courtesy Rob Mac Geoghan collection. 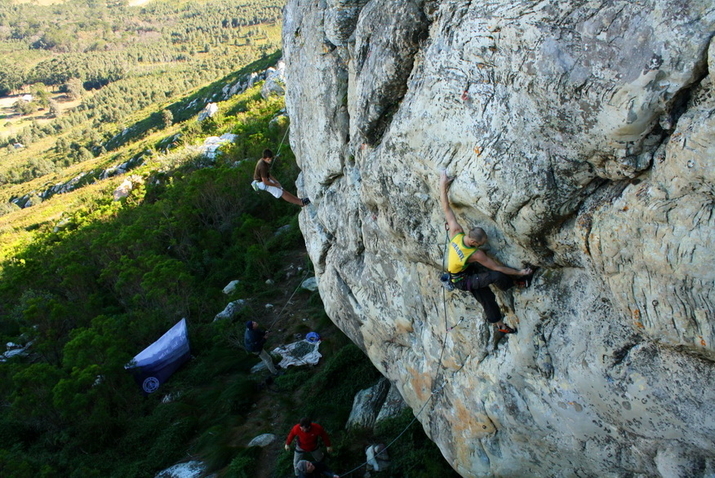 Derek Marshall on a new line at Inyati on the Slipper 2006. Photo courtesy Rob Mac Geoghan collection. 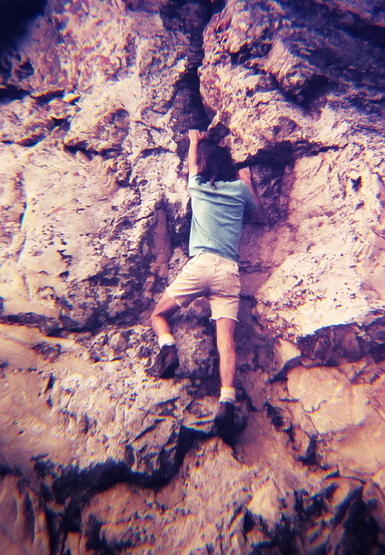 Andrew Forsyth bouldering at After Dinner Mint ~ 1980. Photo thanks to Mike McKechnie collection. 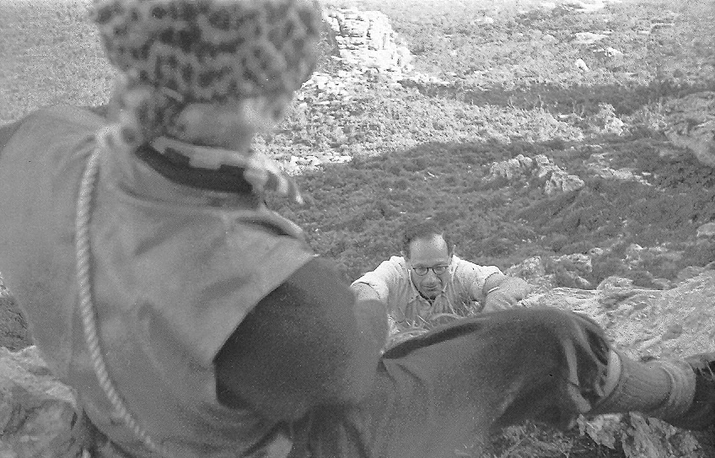 Rob Mac Geoghan cleaning a problem on Brontosaurs ~ 1984 Photo courtesy Rob Mac Geoghan collection. Andrew Forsyth leading Foot Up (17) - Dec 1977. Photo courtesy Andrew Forsyth. 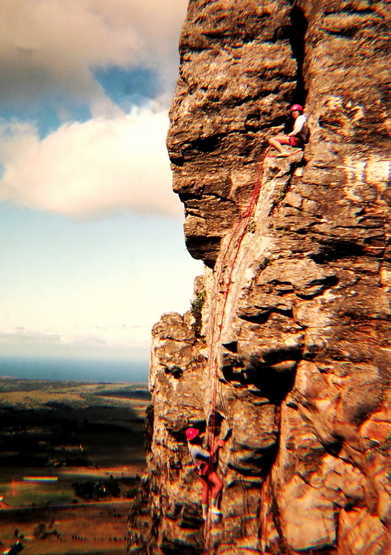 Brett Myrdal climbing & Andrew Forsyth belaying at the Rhino ~ 1980 Photo courtesy Rob Mac Geoghan collection. 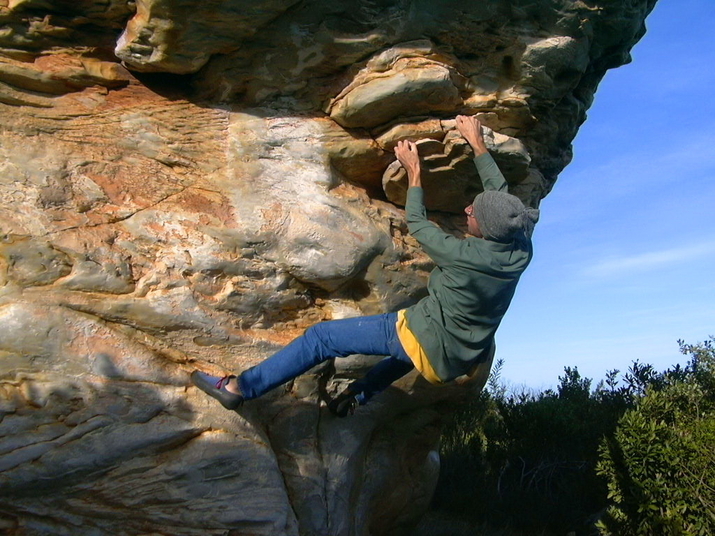 Steven Reed, the only true legend of Eastern Cape climbing, posing on The Wave ...on top rope...hehehe ja Stevie! Show us the Werewolf! 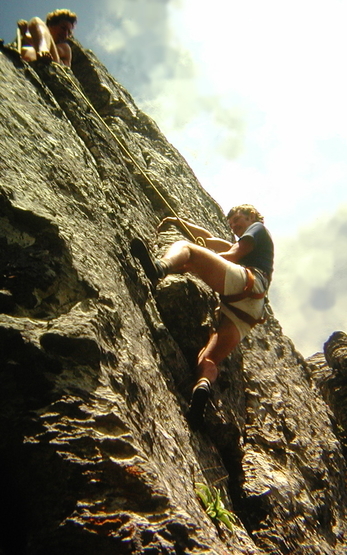 ~ 2003. 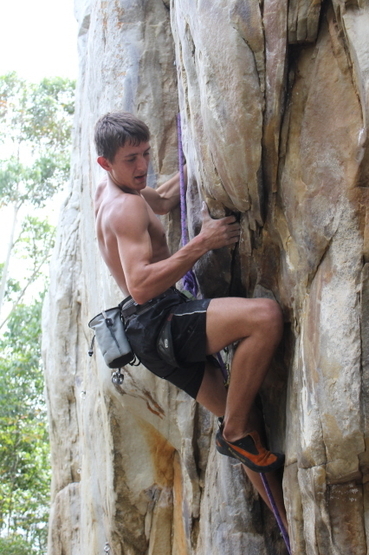 Photo thanks to Morne van Der Mescht. 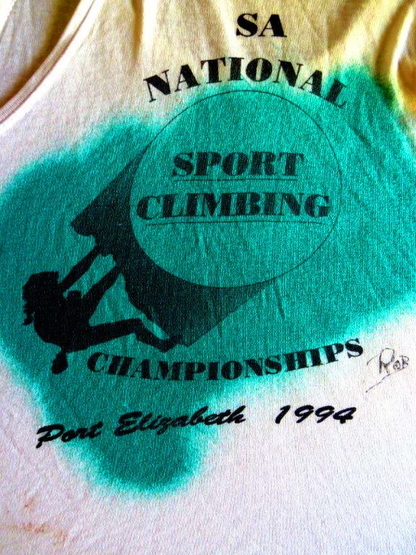 Vest from the first climbing comp held in PE. Photo courtesy Rob Mac Geoghan collection. 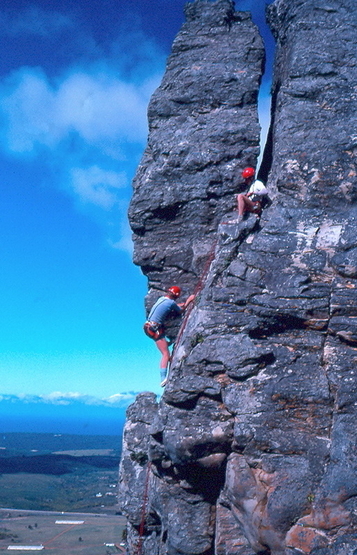 Unknown climbers at Turning Rock ~ 1985 Photo courtesy Rob Mac Geoghan collection. 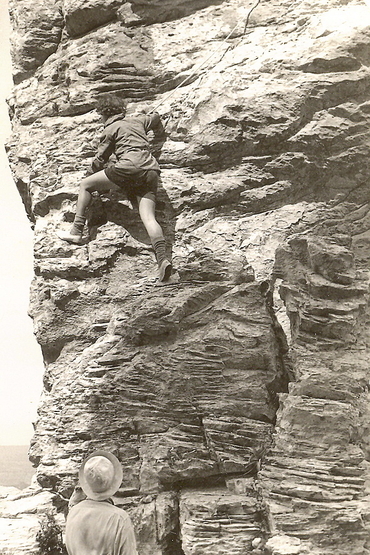 Climbing somewhere on the Slipper, Brett Myrdac ~ 1978, Photo courtesy Rob Mac Geoghan collection. 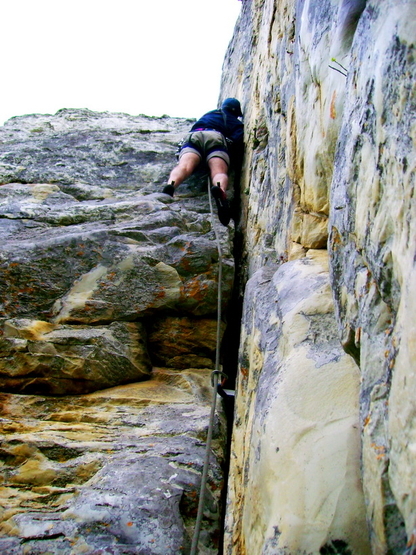 Rob Mac Geoghan following Mike McKechnie on Piton Crack in 2009. Photo courtesy Rob Mac Geoghan collection. 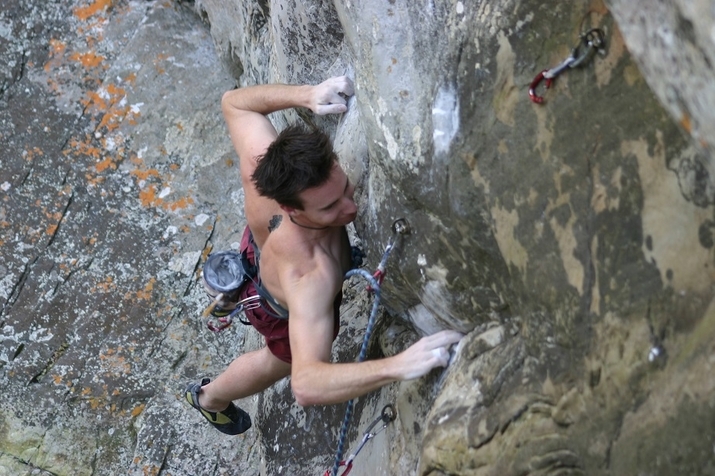 Mike McKechnie repeating Piton Crack in 2009. Photo courtesy Rob Mac Geoghan collection. 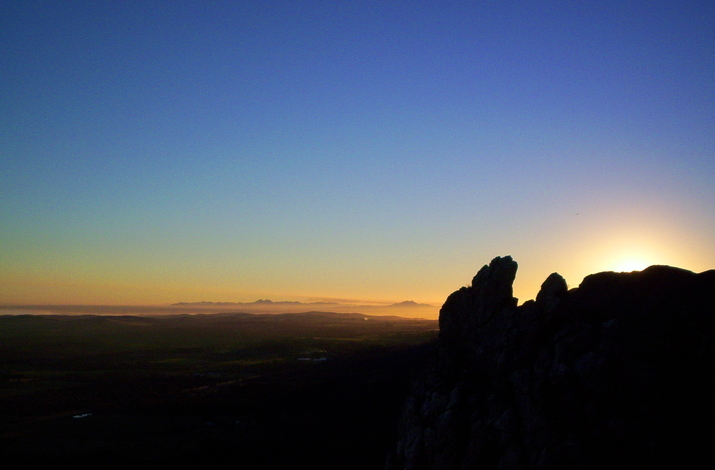 Rob Mac Geoghan watching the sunset on top of Lady Slipper. Photo courtesy Rob Mac Geoghan collection. 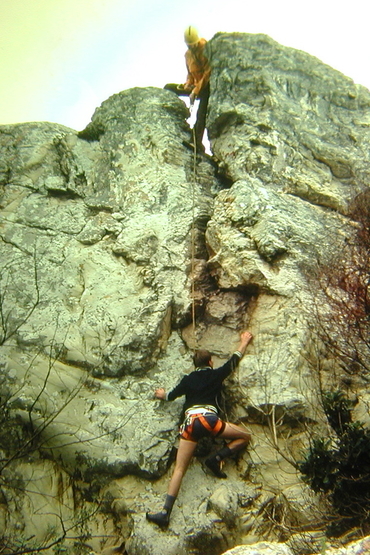 Andrew Forsyth leading McKechnie's Overhang (20) ~1979. Photo thanks to Andrew Forsyth collection. Wayne Clausen following Pixies Pitch ~ 1979. Photo thanks to Andrew Forsyth collection. 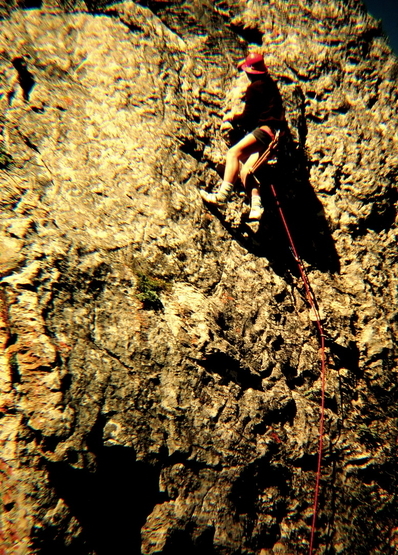 People have been rock climbing on the Lady's Slipper since about 1954. 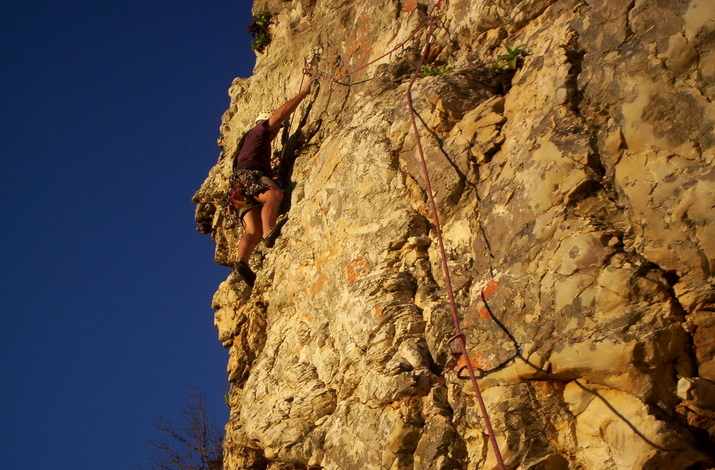 Situated 35km out of Port Elizabeth, the climbing routes are a pleasant walk up a hill. 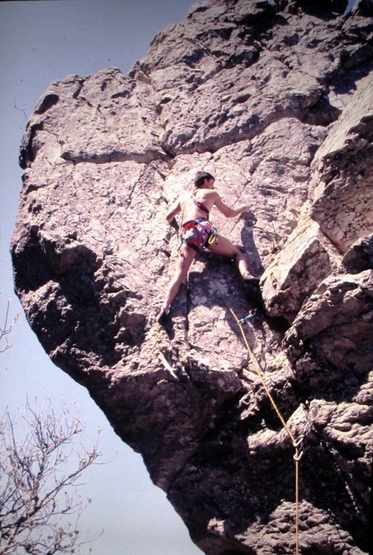 The boulders are scattered, but most are at the base of the Slipper. 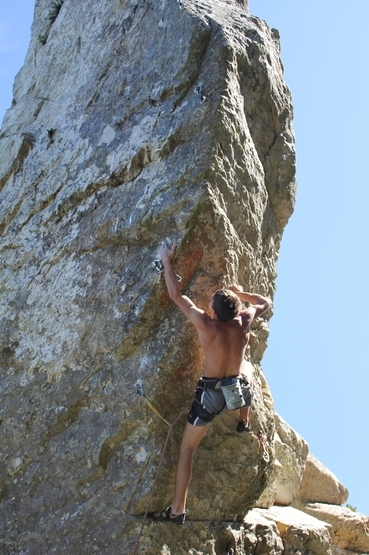 Rock is quartzite. 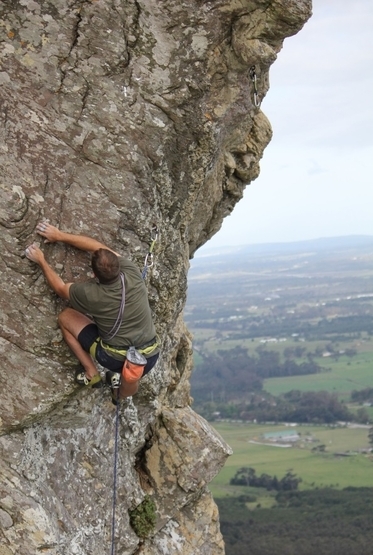 There are 52 sport routes, 333 short trad routes & about 105 boulder problems. 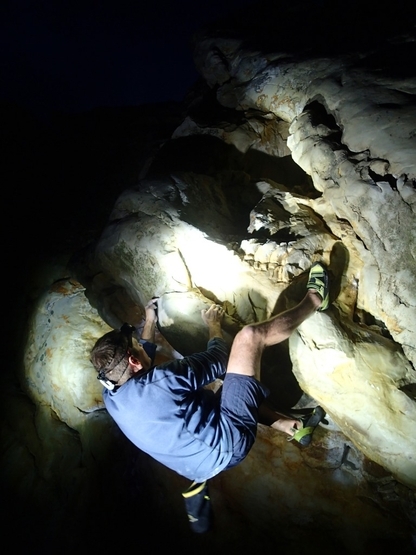 There is some potential for new routes & boulder problems. 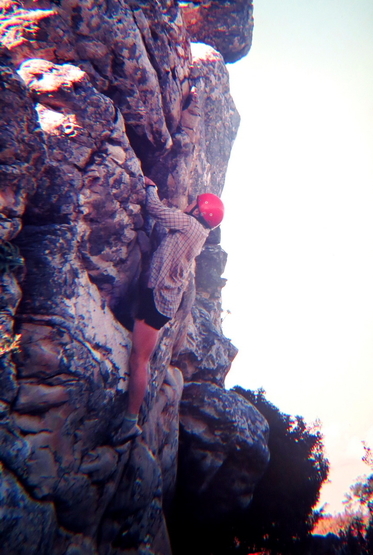 Entrance to Mountain Club members is free. 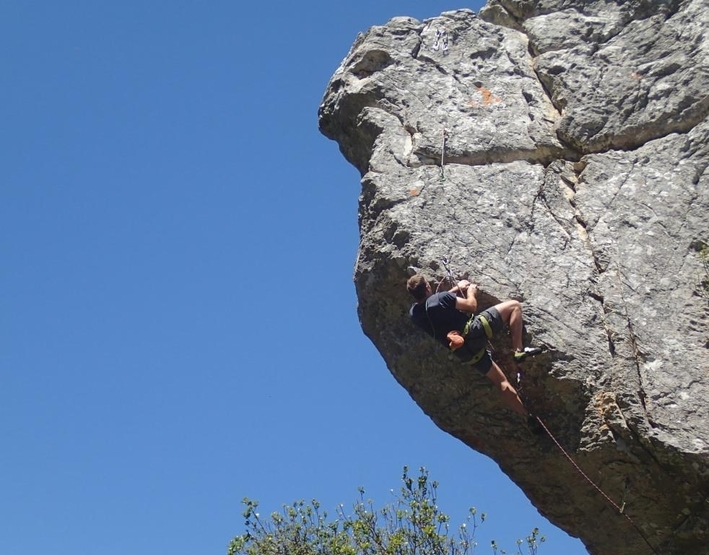 Non-members are required to pay R20 per person for a permit from the pub at Falcon Rock. 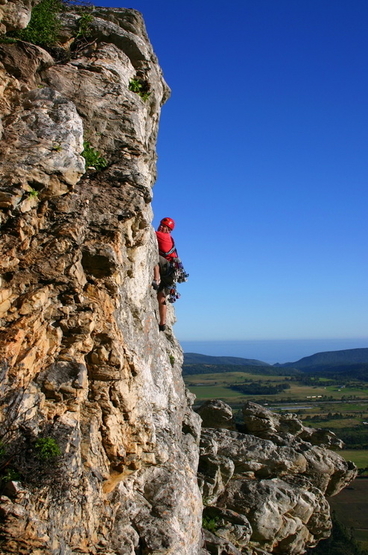 Adventure Centre at Falcon Rock. 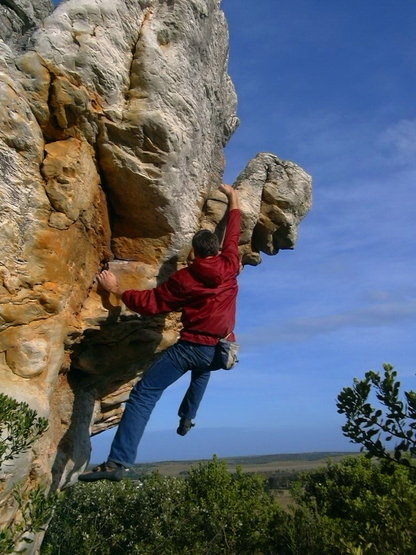 Access to the climbing at Falcon Rock, there is a Day Visitor fee of R20pp. 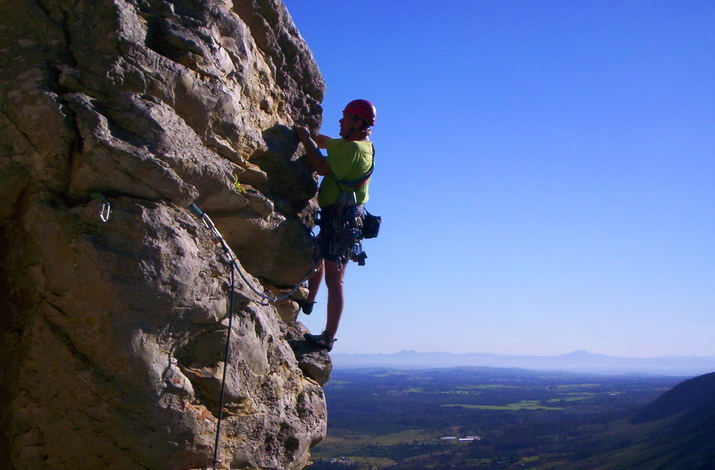 All members of Eastern Cape Rock Climbing and Valley Crag members will be exempt from payment. 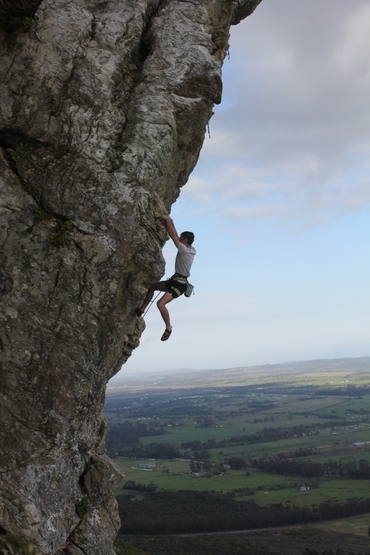 All climbers, including members of the said groups, will need to complete an indemnity at the Adventure Centre before proceeding. In case of nobody being present to assist, during odd hours etc, Gary's contact number is presented on the board at the office where he will be available to assist telephonically. Please understand that due to public liability reasons and the presence of a shooting range, guests not signing in will be considered trespassing. Every 2nd Saturday the Black Powder Club hold a shoot from 2pm to 4:30pm.